After a celeb-studded program that included former Destiny’s Child member Kelly Rowland, gospel singer Erica Campbell and “Key & Peele” star Keegan-Michael Key, Obama ticked off a litany of dismal statistics about low voter turnout, especially during midterm elections like the ones coming up in November. Americans cast more votes than ever in the 2008 election, but even so, more than 80 million still didn’t vote. Only about 40 percent of the population typically votes during midterm elections. The 2014 midterms saw the lowest voter turnout since World War II, with less than 37 percent, she said. 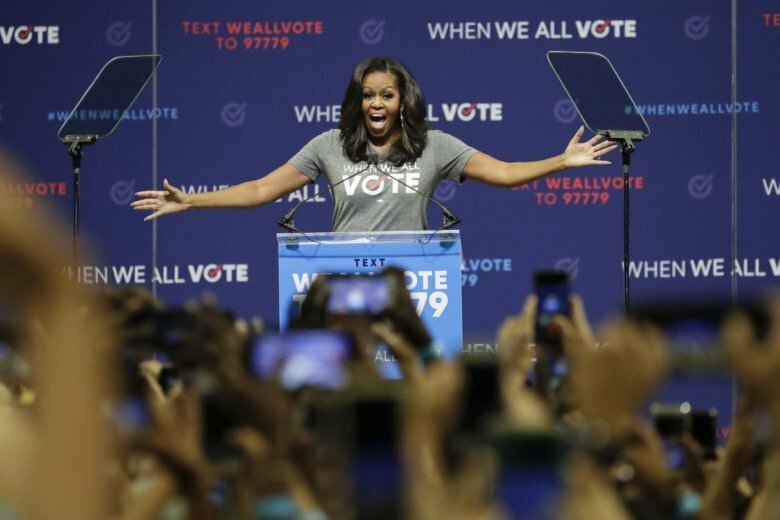 “When a huge chunk of the population sits out of the process, why are we surprised when our politics don’t reflect our values?” she told a crowd of nearly 5,000. No candidate names were mentioned at the event, nor were any political parties as Obama stressed she wasn’t there “to tell anyone who to vote for.” Instead, she was eager to change what she said has become “a dangerous cycle when it comes to voting” of frustrated people who get worked up about politics, but eventually sit home and do nothing. And she addressed naysayers who contend their vote doesn’t matter, noting that a 2016 city commission race in Cocoa Beach was decided by eight votes. In South Daytona, she said, a mayoral race came down to just five votes. Obama recently launched When We All Vote, a national, nonpartisan not-for-profit organization. Friday’s event in Miami capped a week of grass-roots activism with 2,000 events in 49 states. About two dozen students from Majory Stoneman Douglas High School wearing matching shirts sat together at the event. The Parkland students have been part of a massive state and national push to register young voters in the wake of a February shooting at their school that left 17 dead, rallying hundreds of thousands across the country and in D.C. for March For Our Lives. But it’s unclear what impact they will have on the midterm elections. As of Aug. 1, there were nearly 373,000 newly registered voters this year, according to an analysis by University of Florida political science professor Daniel Smith. He said that roughly 1 out of 3 of those new voters is under the age of 30, but he cautioned that it appears to be a “natural ebb and flow” of voter registration that mirrors trends in previous years. He pointed out that many election officials hold drives that target graduating high school seniors. Stoneman Douglas senior Drew Schwartz attended the rally and said he’ll be voting for the first time in November. The 17-year-old said common sense gun laws are among the issues most important to him. “One of the most important issues is representation and for people to make sure their officials are representing their beliefs and not supporting their own interests,” he said.